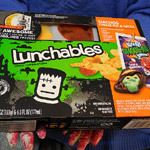 Halloween Lunchables YES! | Dinosaur Dracula! I can’t believe it. It’s finally happened. It’s taken years, but it’s finally happened. We got ‘em, folks. We got Halloween Lunchables. You have NO IDEA how long I’ve waited for this. 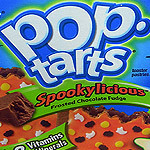 This is my tenth year doing the Halloween Countdown, and during almost every prior edition, I looked for this. Exactly this. It just seemed like such an obvious thing to do, and for the life of me, I couldn’t figure out why Lunchables wasn’t doing it. It drove me CRAZY. Every October, I dug through the Lunchables section of every supermarket I could find, hoping and praying for something orange. The cheese didn’t count, for it was always too yellow. Until now, every search was a bust. A horrible bust. Still, I knew it would happen, someday. It had to. 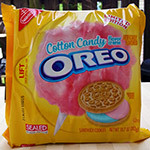 It was fate, it was destiny, and it was a chance to get extra mileage from those special Oreos with the spooky creme. Oh yes — the wait is over. HALLOWEEN LUNCHABLES are here. Call your friends, call your relatives, call anyone who likes turkey in the shape and scale of Oxy pads. I’m not sure if there are other versions of Halloween Lunchables out there. I could only find this one. 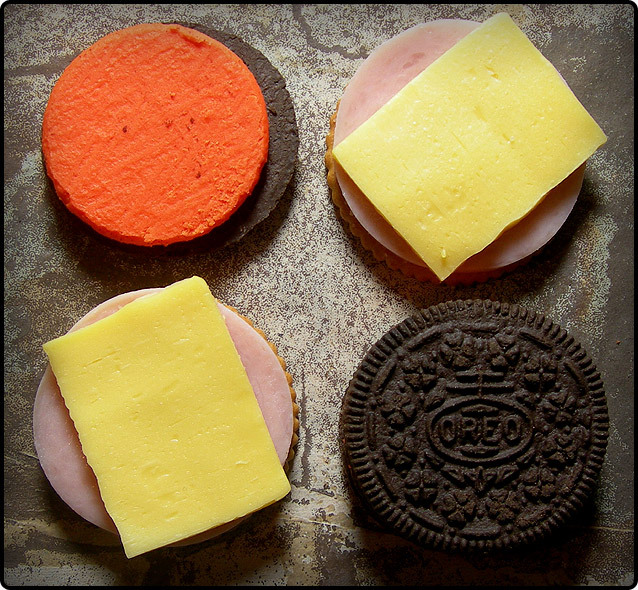 The turkey & cheese “cracker stackers” one. You know, “the classic.” They made the right choice, but I still hold out hope that King Lunchable will do the same for one of his make-your-own pizza kits. BECAUSE I NEED TO ARRANGE THAT MOZZARELLA IN THE SHAPE OF A GHOST. Good, I was right. Capped words make plain statements read like jokes. I’M SITTING AT MY DESK. The wrapper art is just fantastic. It’s full of Halloween symbols (even pitchforks that could be easily mistaken for candelabras), and it’s all presented in a choiiiiice shade of jade green. They want you to think “slime,” but nuh uh. 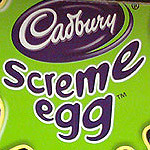 I know jade when I see it. And I always love it when I do. 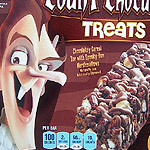 I was so afraid that they’d limit the spookiness to the wrapper art, but no sir. They went all-in. 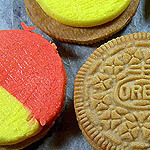 Included with the turkey Frisbees and phony Ritz crackers are HALLOWEEN OREOS, with a creme so orange it might as well be red. This is a far cry from our wildest dreams (mine involves “chicken dunks” in the shape of monster feet), but it’s still a solid…uh…the word…the one that means you ran to third base…TRIPLE. It’s still a solid triple, and in a way, I’m glad it’s only a triple. Because now that Halloween Lunchables are here, I forbid them to ever go away. Come October 2013, I expect…nay, demand, to see them return. And maybe next year is when they’ll hit that home run. Maybe next year is when we’ll get chicken shaped like werewolf paws. Finally, something to look forward to. The rest of you can book your stupid vacations, and spend your stupid six months salivating over those glorious weeks-to-come. I don’t need them. 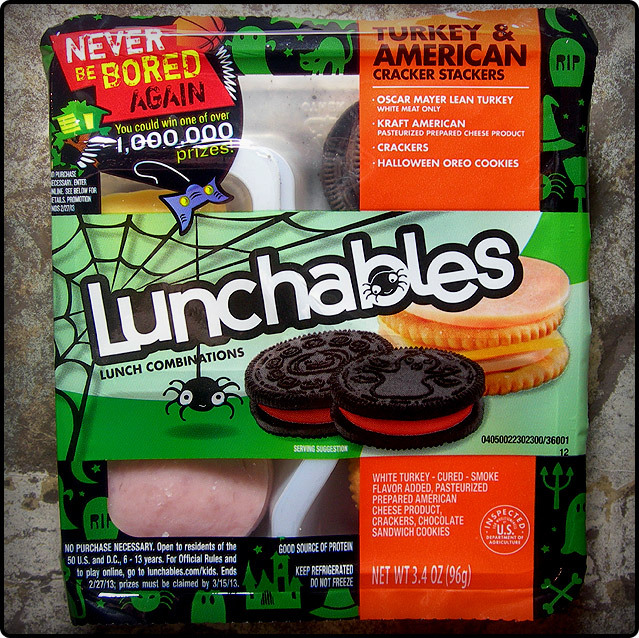 I’ll get through my days with visions of next year’s Halloween Lunchables. Man, now that I’ve written that, it sounds so depressing. Things like this go a long way in explaining why I so rarely smile. Things like this, and the fact that my overbite is such that I can actually open cans by rolling them across my top teeth. Eh, screw that. Today is not a depressing day. Today is a happy day. A really, really happy day. Today is the day I found Halloween Lunchables. Today is also the day my DVR snagged the episode of 227 guest-starring Pee-wee Herman. Now I’m going to the couch, where Mary Jenkins and Pee-wee and a tray full of cookies and meat await.